High Quality Content by WIKIPEDIA articles! Together is a 2002 Chinese drama film directed by Chen Kaige and starring Tang Yun, Liu Peiqi, Chen Hong, and Wang Zhiwen. 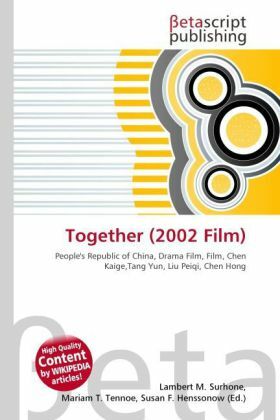 The film premiered on September 10, 2002 at the Toronto International Film Festival, and was commercially released in China ten days later. Written by Chen Kaige and Xue Xiaolu, the plot revolves around a thirteen-year-old violin prodigy Liu Xiaochun and his father Liu Cheng who move to Beijing from a small southern town. It is Liu Cheng's biggest dream that Xiaochun may find a good teacher in the city and rise to stardom. After studying under two teachers, however, the boy finds that he has learned not just music, but what is really important in life.